Most of us associate Tulips with Holland, which in a way is not surprising as they grow more tulips than anywhere else in the world, in fact 3 billion tulips annually. The Tulip is not a native to Holland. 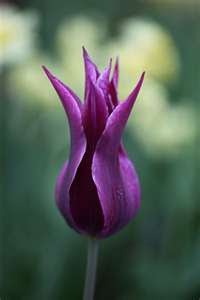 The genus Tulipa (Tulip) grows naturally from S.Europe, N. Africa, W. Turkey to Iran and further on to N.W. 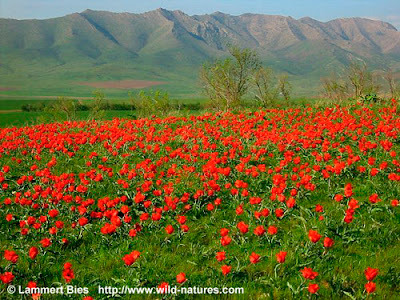 China, but the centre of Tulip diversity lies in the Pamir, Hundu Kush and Tien Shan mountains. There are about 109 different species of Tulip in the world. 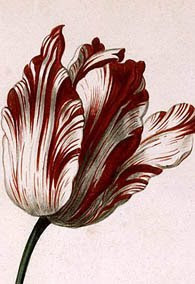 The very first flower that was commercially cultivated was the Tulip during the Ottoman Empire. It was a much loved flower at the Persian and Turkey's courts. Sixteenth century Europe was coming out of the dark ages and was interested in every new discovery and invention. When Ogier Ghislain de Busbecq (1522-92), a Flemish diplomat and ambassador to the Emperor Ferdinand I at the court of Suleiman de Magnificent in Constantinople, saw for the first time the Tulip, he was enthralled and immediately wrote to his friends in Europe about it. His guide had mentioned to him that the flower was shaped like a "Tulband" meaning round. Busbecq thought he meant the flower was called a "Tulband". 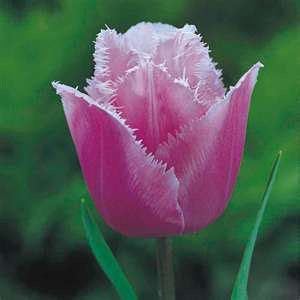 In fact the Turkish name for the tulip is "Lale". We, in Europe, started off by calling the tulip "Tulband", then it changed to "Tulipan" and eventually Tulipa, which is still the official latin name for the flower. Busbecq sent tulip seeds to his friend Carolus Clusius (1526-1609), who was then the Prefect of the Royal Medicinal Garden in Prague. 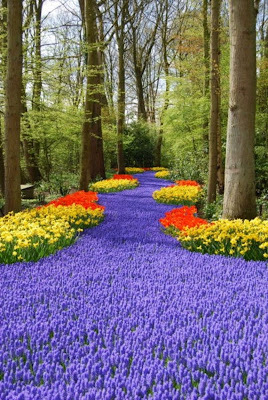 Subsequently he became the Prefect of the Botanical Gardens in Leiden (The Netherlands). 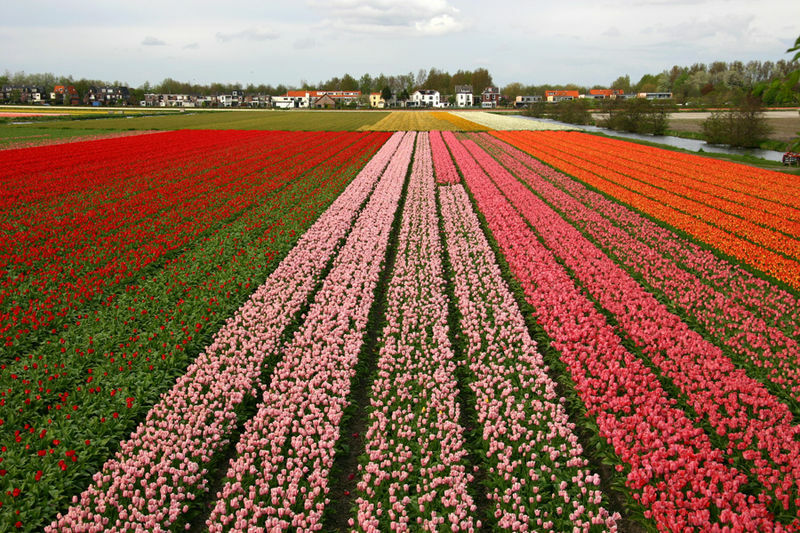 Little did he know that the soil around Leiden was particularly suited to the cultivation of Tulips. 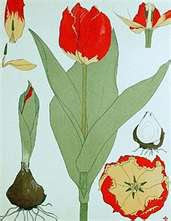 The Tulip became an obsession for Clusius and by 1592 he had collected over 600 bulbs. One night many of his bulbs were stolen, after the theft he lost interest in the Tulip bulbs, but in the meantime the popularity of the flower had spread through Europe. The source of all todays commercially grown Tulips is considered to come from Tulipa gesneriana which was the collective name given to the tulips introduced to Europe from Turkey from 1554 onwards. sell for 4,600 florins (guilders) in today's terms just over 2,000 €, plus a new carriage and pair, for just one single bulb of 'Semper Augustus'. 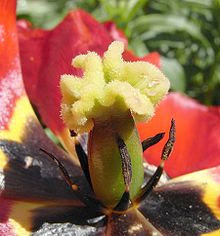 We know now that the splash of colour on the Tulip flower was caused by a mosaic virus transmitted by the green peach aphid. The virus eventually destroys the bulb. Nowadays the virus is virtually eradicated from the Tulip fields. The multi-coloured Tulips we see today are a product of selective breeding. Most people treat Tulip bulbs as annuals, replanting them each year as out of experience they find that in subsequent years the Tulip becomes less and less showy. A Tulip is in fact a perennial flower, but why is it not acting like other perennials? The reason lies in the fact that Tulips originate in areas of the world with cold winters and very hot dry summers, our climate is quite different. 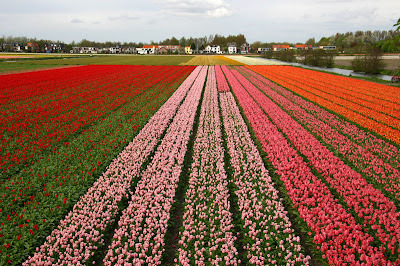 The success of the Dutch growers has been that they have managed to ape the conditions the Tulips naturally like. They were lucky that when the Tulip bulb was introduced into Holland, it was in Leiden, an area ideally suited to growing bulbs. 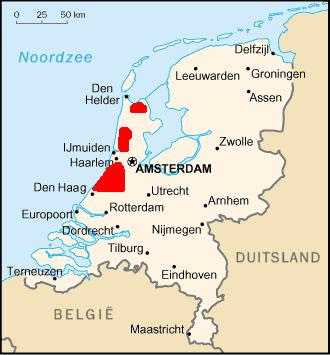 Today the bulb industry is concentrated in a narrow stretch of sandy soil just behind the dunes, the main area being between Haarlem and Leiden. Professional Dutch growers subject the bulbs to a specially designed heat and humidity treatment each summer. This manipulation of temperature and humidity levels allows growers today to perfectly replicate the native conditions. By the time the bulbs are replanted into the soil for their winter sleep, they have been fooled into thinking they have just been through a summer drought in the Himalayas. There are Tulips available that naturalise. These are generally specie tulips like Tulipa kaufmanniana, Tulipa fosteriana, Tulipa greigii, Tulipa saxatilis and Tulipa tarda and others that have not been cross-bred and consequently are very close to the bulbs found in nature. 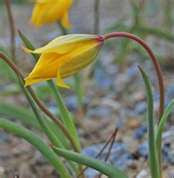 Here in the Var we have a native tulip called Tulipa sylvestris, 3-7cm tall, it blooms from April to May. 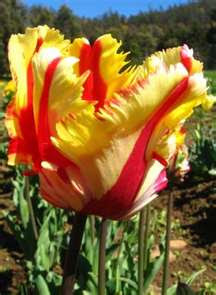 Among the hybrids that perennialise best are all the Darwin Hybrids in red, rose, orange, yellow and two-tone colours. Emperor tulips and some Triumph Tulips also perennialise. Tulips can be propagated through offsets, seeds or micropropagation. Seed grown plants show greater genetic variation, seeds are used to propagate species and new hybrids. Many Tulip species readily cross pollinate with each other. When Wild Tulip population overlap each other in an area, they often hybridize and create genetically mixed populations. Commercial Tulip cultivars are complex hybrids and normally sterile. Those that produce seeds have normally offspring very different from the mother plant. Tulip grown from seeds take 5-8 years before flowering. Offsets and Tissue culture in vitro (Micropropagation) methods are means of asexual propagation for producing genetic clones of the parent plant, which maintains its genetic integrity. Plant bulbs in well drained soil. Wet soil promotes fungus and disease and can even rot bulbs. Plant bulbs deep - about 8 inches (20cm) deep, measuring from the base of the bulb. Water bulbs after planting, sufficient water is necessary to get them growing. Water is especially important after planting to make sure the bulbs develop a strong root system before going into winter dormancy. In spring after flowering, take off the flower head, but leave the stalk and the leaves to die back. This technique puts the energy back into the bulb. Fertilise the soil in autumn with a low nitrogen fertiliser like cow manure. If you replace your bulbs annually it is not necessary to fertilise as the tulip has its food stored in the bulb. Fill bottom of pot with crocks. Add soil mixed with sand for better drainage. 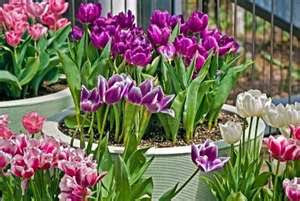 Follow planting instructions on bulb package, if they are not available, planting depth is 2x the diameter of the bulb. 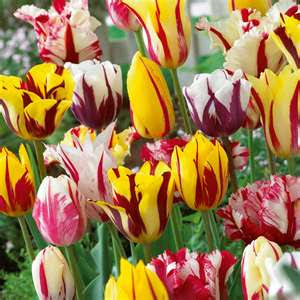 Garden Hybrids are divided into Early, Mid-Season and Late flowering tulips. 3. Triumph tulips: late April to early May. 4. Darwin hybrids: early to mid May. 5. Single late tulips from early May. 6. Lily-flowered tulips end of April. virus. These tulips below resemble the Rembrandt tulips but without the virus. 11. Double late tulips: late May. Sue told me, she had heard that all parts of the Tulip are poisonous. I know, being Dutch, that during the latter part of the 2nd World War, when there was no food available people ate Tulip bulbs. I found many references to the fact that the Tulip is poisonous. In fact you can eat the Tulip petals, in a salad for instance, they are not poisonous. In the Dutch "Hunger Winter", the bulbs were peeled like you do for an onion, the yellow central part of the bulb was cut out (this is the poisonous bit). They were added to soups and even a kind of loaf was made with them. So yes, some parts of the Tulip are poisonous, but there are also edible parts. 1. Cut the bottom of stalks at an angle, remove outer leaf; put just 5 cm of water in the vase. The tulips have to work to get water, that makes them stay straight. Check regularly the water level. 2. Never put tulips and daffodils in the same vase, daffodils excrete slime, because of this slime the tulips start to hang. 3. In a bouquet with other flowers, cut the tulips a bit shorter than the other flowers; tulips grow in the vase. 4. When oasis is being used in a flower arrangement; first make a hole into the oasis with a stick, then the tulip. 5. During transport do not put the tulips in water, leave them dry. 6. If the tulips start to hang: wrap them in paper, cut a bit off the stalk and put them in water; leave them in a cool place till the tulips are straight again. Pleuvra ? Pleuvra pas ? Finalement il n’a pas plu et nous sommes allées à Sillans la Cascade. Yannick Dolmetta nous a accueillies ce vendredi matin pour la visite de la safranière, il nous a parlé de son travail avec un grand enthousiasme et c’était un réel plaisir de partager ce moment avec lui. La safranière est implantée sur la commune de Sillans la Cascade, 100 000 bulbes de crocus ont été plantés sur une surface de 8000m2 (soit une densité moyenne de 35 bulbes au m2). La safranière est en conversion bio, le fumier de chèvre est utilisé pour amender le sol. La récolte se fait entièrement à la main d’octobre à décembre, la cueillette s’effectue le matin quand les fleurs s’épanouissent, l’émondage se fait après la récolte journalière, les stigmates sont étalés sur des plaques pour sécher pendant 4 jours dans une pièce à 25° puis l’affinage dure un mois à l’abri de la lumière dans des pots de verre. Les fleurs de safran sont laissées sur le sol après l’émondage pour les abeilles. Safran vient du Perse "za'farân" qui signifie" jaune". Le safran : crocus sativus plante monocotylédone vivace à bulbe de la famille des iridacées, de l’ordre des liliacées (ce crocus est très toxique) est l’épice la plus chère du monde et la plus « falsifiée » : son prix est très élevé : 30 à 40 euros le gramme soit 30 000 euros le kilo pour du safran produit en France. Cela s’explique par le fait que, pour obtenir un gramme de safran il faut récolter 140 à 160 fleurs de crocus, un kg de stigmates secs représente 140 00 à 160 000 fleurs. Le crocus sativus est originaire du Moyen Orient, il a été introduit en France lors des Croisades. Il a été cultivé jusqu’à la fin du 19ème siècle dans les environs d’Albi, d’Angoulême, du Gâtinais (Boysne était la capitale mondiale du safran), en Normandie, en Provence et même en Suisse. Le safran a probablement été d’abord utilisé pour ses propriétés thérapeutiques : antispasmodique, emménagogue, sédative, stimulante, tonique. Le safran est aussi utilisé en parfumerie (le dernier parfum d’Armani en contient) et en cosmétique pour les pétales. Le safran était utilisé comme plante tinctoriale (la robe des moines bouddhistes…), il existe encore sur Paris une femme qui pratique ce type de teinture. La densité de plantation peut varier de 20 à 50 bulbes au mètre carré. Plantation en août, récolte d’octobre à décembre. Le crocus peut rester en terre durant 3 récoltes, il faudra après l’arracher au mois de juin, diviser les bulbes et les replanter.